Artist Kendall Johnson poses for a quick photo during a reception of "Melting Into Air," an exhibition of his works, on Nov. 7, 2018. Kendall Johnson wants you to touch his art. The Claremont-based artist is okay with those viewing his works to run their hands along his paintings to connect with them on a different level. “What do you guys see here in general? Texture. So, I give you permission to mash my pictures to get a sense of them and to discover them for your own interpretation,” Johnson said on Nov. 7 during a reception for “Melting Into Air,” an exhibition of his art now on display in the CHC Art Gallery. Curated by Crafton student Yadira Dockstader, the exhibit puts a spotlight on some of Johnson’s works created between 2005 and now. Some are paired with a poem written during different time periods of his life to help paint an added picture not always seen on the surface. 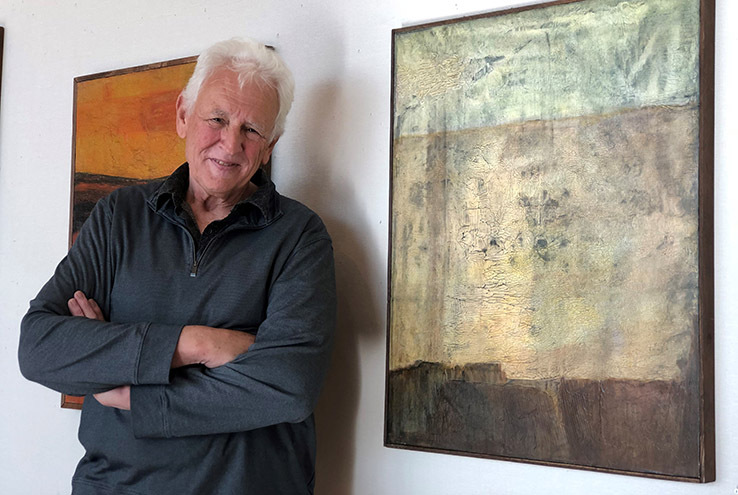 “The whole exhibit are paintings I did a number of years ago that all come back to a theme of landscape and desert,” Johnson said, “and they all come back to me capturing the energy of those landscapes and deserts. Parts of that ideology is allowing others to access his works. Along with incorporating an idea of touch into “Melting,” Johnson gave Dockstader full access to his gallery without interruption. Dockstader said she used her experience as a Crafton art student to curate the exhibit, adding later curating was a missing piece in her understanding the whole concept of being an artist. Although Johnson’s works have hung at other galleries, the artist said he was absolutely “floored” with the results of “Melting.” Much of his reaction is credited to Dockstader’s careful decision making and how his works are displayed in and around the gallery, he said. “Melting” is on display through Nov. 19. To learn more or for gallery hours, call 909-389-3353. Crafton Hills College student Mirsha Ocampo, 19 of Calimesa, interacts with a painting by Kendall Johnson during a reception for "Melting Into Air" on Nov. 7, 2018. Curator Tadira Dockstader (right) talks with Crafton Hills College students during a reception for "Melting Into Air" on Nov. 7, 2018. Art enthusiasts listen to Kendall Johnson talk about his works during a reception for "Melting Into Air" on Nov. 7, 2018.